In the immediate aftermath of World War II, Thomas Joseph Dodd, a Norwich-born lawyer from Connecticut, served on the United States’ prosecutorial team at the International Military Tribunal (IMT). The tribunal, which the Allied nations assembled in order to try Nazi leaders for war crimes, took place in 1945-46. The IMT, which is often referred to as the Nuremberg trial (after the German city in which the proceedings took place) was an unprecedented effort to hold leaders of a nation state accountable for their wartime actions while also endeavoring to uphold their rights to a fair trial. Dodd, as the second-ranking lawyer for the US prosecution, supervised the team’s day-to-day management. He, along with chief US prosecutor Robert H. Jackson, also shaped many of the strategies and policies. Additionally, Dodd prepared indictments, presented evidence, and cross-examined defendants. Excerpted from “Connecticut Lawyer Prosecutes Nazi War Criminals at Nuremberg” by Laura Smith for ConnecticutHistory.org. To what extent is the international community responsible for the protection of human rights? What was the purpose of the International Military Tribunal in Nuremberg, Germany from 1945-1946? How did the United States assist in the prosecution of Nazi war crimes? What role did Connecticut lawyer Thomas Dodd play in the Nuremberg Trials? What was the significance (legacy) of the Nuremberg Trials? Thomas Dodd Courtroom Scene. Thomas J. Dodd Papers. University of Connecticut, Archives & Special Collections, University of Connecticut. Thomas Dodd with Shrunken Head Exhibit. Thomas J. Dodd Papers. University of Connecticut, Archives & Special Collections, University of Connecticut. Having studied U.S. involvement in World War II and how the Allies won the war, students will focus on the post-WWII consequences for Nazi military officers charged with “war crimes” and crimes against humanity. 1. Using one of the two suggested photos of Thomas Dodd in the Toolkit as their “question focus,” students will examine the photo and write as many questions as they can. 2. Working in pairs or small groups, students will discuss their questions with classmates, improve their questions, and decide on three questions that will drive their research on Thomas Dodd and the Nuremberg Trials. 3. Working with their partner(s), students will use primary and secondary sources about the Nuremberg Trials (see recommended websites and articles below) to help them answer their supporting questions. 4. Finally, students will revisit the compelling question and discuss the impact/legacy of the Nuremberg trials today. Students will synthesize and share their research findings and results of their inquiry investigation orally or in writing. Students will investigate later war crime trials/tribunals and write an analysis of the legacy of the International Military Tribunal (the Nuremberg Trials) and Thomas Dodd in protecting/supporting human rights worldwide. Explore one of the Online Exhibitions from the United States Holocaust Memorial Museum. 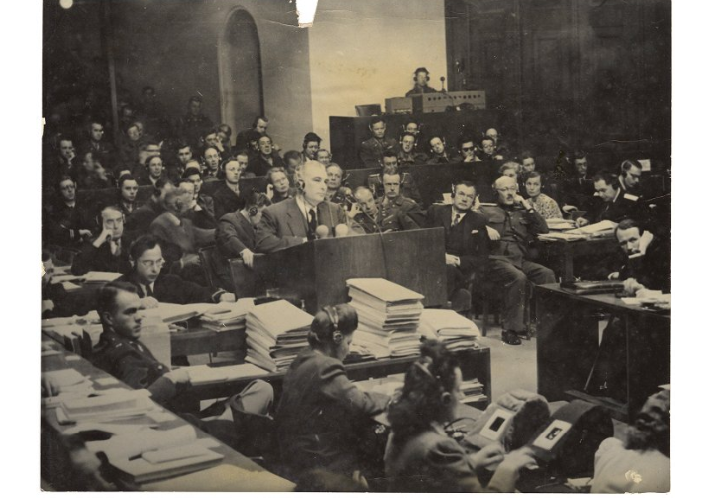 International Military Tribunal at Nuremberg, Thomas J. Dodd Papers Digital Collections, University of Connecticut Libraries, Archives & Special Collections. PBS Legacy Of War: The Nuremberg Trials Excerpt, posted by Robert Jackson Center. Thomas J Dodd of the American prosecution delivers a speech during the Nuremberg, posted by CriticalPast. “Connecticut Lawyer Prosecutes Nazi War Criminals at Nuremberg.” by Laura Smith for ConnecticutHistory.org. “International Military Tribunal at Nuremberg.” Holocaust Encyclopedia, United States Holocaust Memorial Museum. “Thomas Dodd and the Shrunken Head of Buchenwald.” by Lawrence Douglas for the University Libraries Human Rights Archives blog, University of Connecticut.